Some of the alien plants aren’t all bad. They’re here because humans brought them here, either on purpose or by accident. We’re stuck with them, so why not try to enjoy the aliens or non-natives? If we see there is direct competition, we may be able to help our native friends out. For instance, when the garlic mustard gets too numerous along the lane, we just walk down the lane, pull out the plants, and let them lay on the road. They’re shallow rooted and very easy to pull up, especially in the Spring when there is a lot of moisture to the ground. The plants left to lay in the road should dry up and not be able to grow more or set seeds. I enjoyed seeing that the ‘keepers of the forest’ at Little Buffalo State Park do the same thing. On my trail walks there I’ve seen the pulled out garlic mustard plants withering in the middle of the trail. After pulling up the garlic mustard plants there will be fewer plants the following year. They won’t be extinguished as there are very short plants, maybe six inches tall, that bloom and most likely set seed. 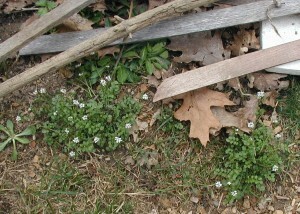 The little plants more easily hide from us weed-pullers, so they probably will help to produce the following generations. Another alien plant that blooms prolifically and will always be here is the mustard plant. 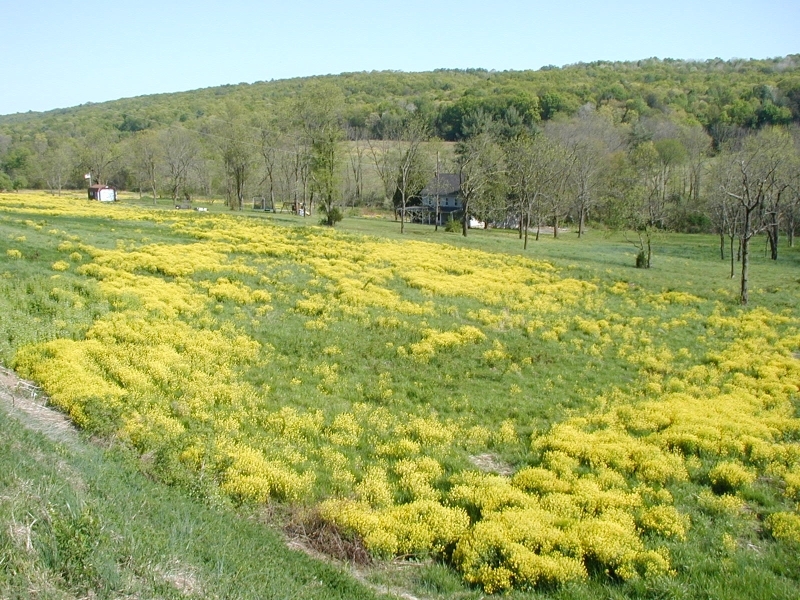 The Peterson Wildflower Guide tells us there are several alien mustards, Brassica spp., in the Eastern U.S. – white mustard, charlock, black mustard, chinese or indian mustard, and field mustard. You have to look at the foliage to determine the species. Bright yellow four-petaled flowers in terminal clusters and slender erect seed pods are common characteristics of mustards. 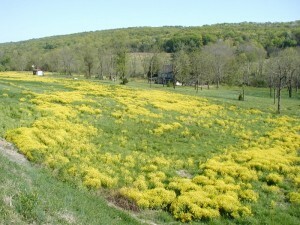 When you have a mass blooming of mustard in open fields, it surely gives a lot of color to the landscape. 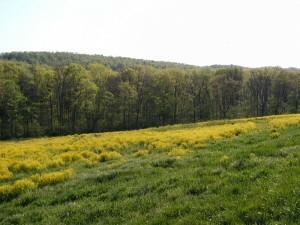 Yellow blossoms of mustard fill this open field. Mustards flowering in a fallow field. Of course, the mustards are edible. If one was the industrious type she could harvest the young leaves for cooked greens or salads. The older leaves are too bitter, so collecting mustard leaves has to be done on the earliest warm days of Spring. The seed pods can be pickled and the ripe seeds can be ground to make a spicy mustard. Photos of mustard fields taken 30 April 2010. 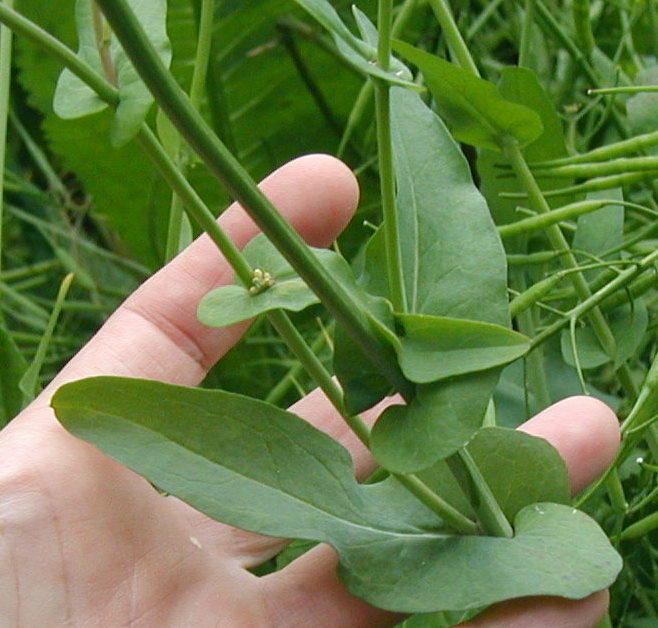 Field mustard, Brassica rapa, is distinguished from the other mustards, like white mustard, charlock, black mustard, and chinese or indian mustard, by the lower lobes of the leaves which practically wrap around the stem. Ear lobes on leaves of field mustard. Long, skinny seed pods of field mustard. The seed pods may be 2 inches long and slender, not to mention numerous. Field mustard plants heavy with green seed pods. 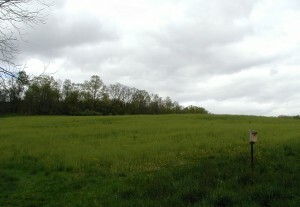 The 3-ft. tall field mustard plants above were growing in waste ground between an access road and the highway. Heavy with seed pods the tops of the plants tipped over to one side. Field mustard photos taken 17 May 2010. The road crew will probably mow down the mustard before the seeds ripen, but I’ll keep my eye on this patch for potential harvesting. Spicy mustard sounds nice! Growing in the farmer’s fields at this time of year are crops that were planted last fall, like wheat or grass. If crops were not planted to overwinter, then weeds have taken hold and many of them are now flowering. After winter and early spring the ground is wet and must dry out enough before farmers can work the soil. Tractors can’t get into the fields when the soil is too wet or there is a great chance of getting stuck in the mud. Besides, the soil has to be dry enough to be able to be tilled or planted. Environmentally-minded farmers will plant fall crops to protect the soil and to keep weeds at a minimum. Doesn’t it make sense to plant a crop in the fall to save the topsoil from blowing away? 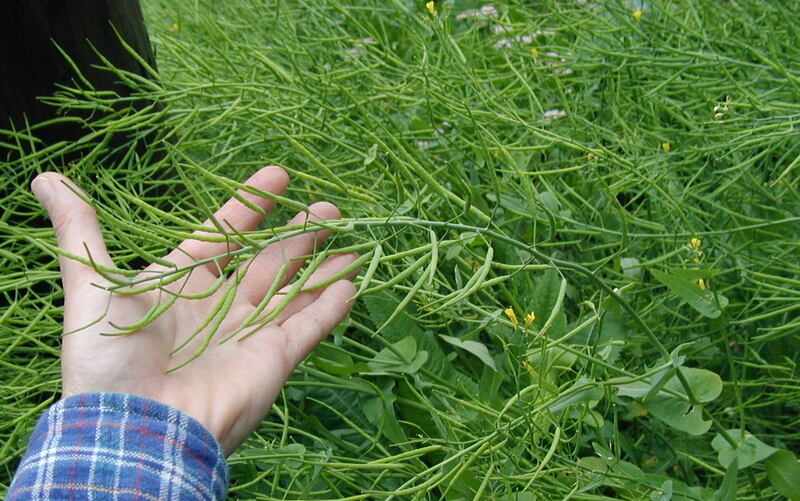 Even if it’s not a cash crop, the benefit to the farmer and the environment is great. Why not plant a crop that could be turned under instead of letting weeds grow that will be sprayed with herbicides that pollute the air, water and soil? Weeds will grow where ever they can. If there is bare land, weeds will try to grow on it. Weeds can be defined as “plants that grow where you don’t want them to grow”. So, anything growing in a farmer’s field that the farmer didn’t plant can be called a weed. 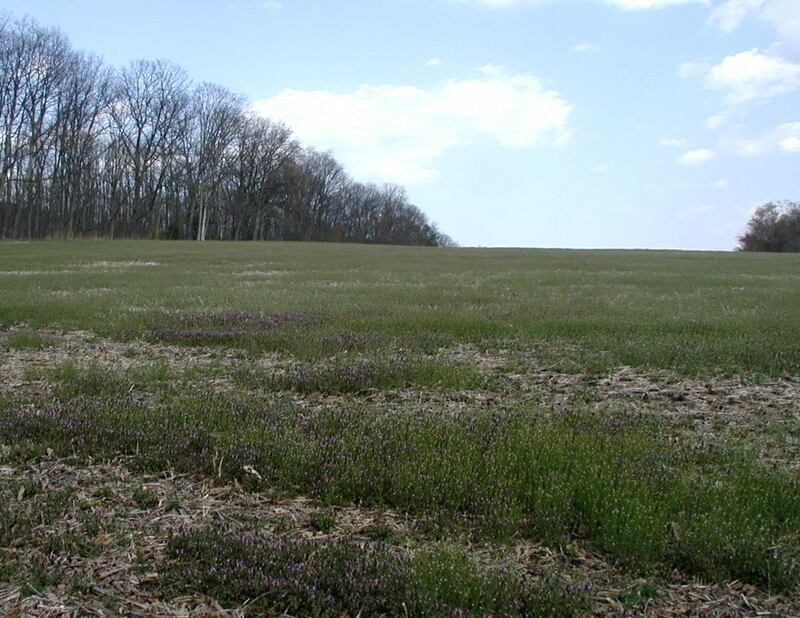 Field weeds are those types of plants that quickly colonize empty areas, especially areas with little competition. Open fields certainly fit that description and are the perfect places for weeds to grow explosively. 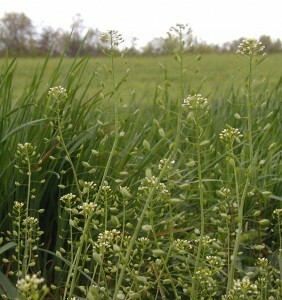 An example of these field weeds can be found in a nearby field. From a distance you can see some “green” plants growing with a few colorful spots here and there. A farmer's field with many weeds. On closer inspection one can see that two field weeds have exploded to overtake most of the field. This field is typically planted with corn or soybeans, but right now it’s filled with Pennsylvania bittercress and purple dead nettle. Pennsylvania bittercress and purple dead nettle blooming in the farmer's field. 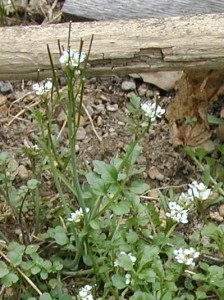 The taller weed with the little white flowers is Pennsylvania bittercress. Note the long seed pods sticking straight up. 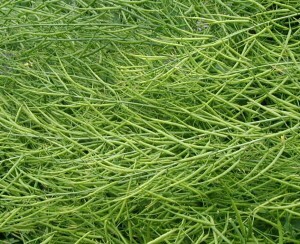 Setting seed so early in the growing season guarantees that we’ll see this weed again next year. 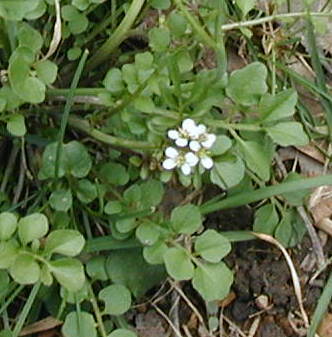 PA bittercress has basal leaves to collect sunlight and the energy needed for the plant to flower and reproduce. It is large enough to reproduce before its purple co-hort has grown to any size, so competition between the two is reduced and they can flourish together. 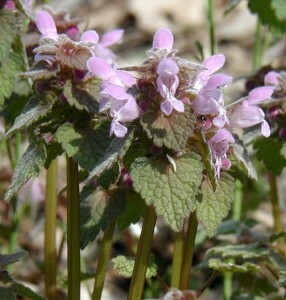 The purple dead nettle flowers are irregular in shape having one large upper lip forming a sort of hood and two lobes on the lower “lip” with each flaring out to a side. The blooms are light purple to lilac on the outside and spotted on the inside. 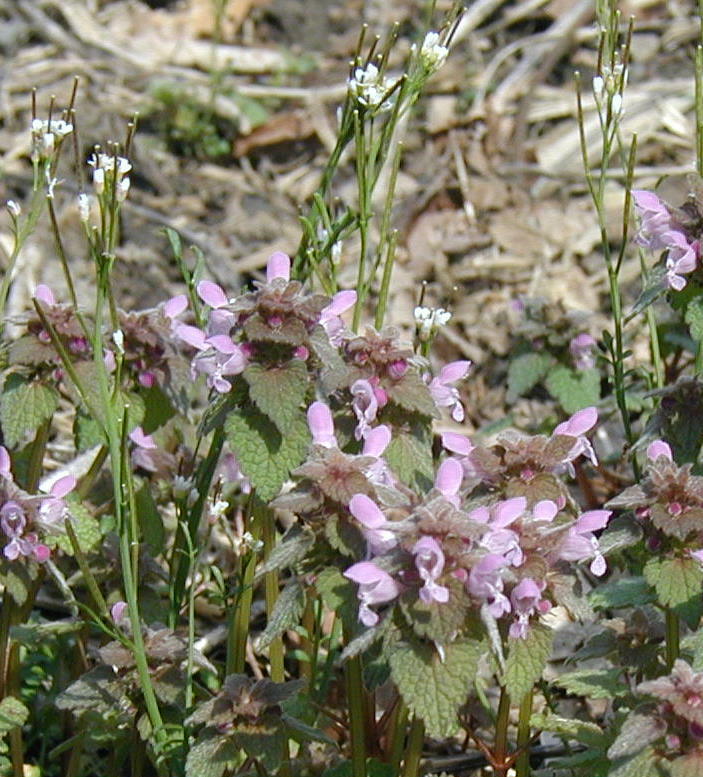 Irregular flowers of purple dead nettle. Blooms peak out from under each layer of leaves and several flowers are open at any given time. The triangular, heavily-veined leaves appear quite uniform as they arise from the four sides of the square stem. Farmer's field full of field peppergrass. In the image above the light green weeds in the farmer’s field is peppergrass. Unless you know your food crops, the above field almost looks planted for a purpose. 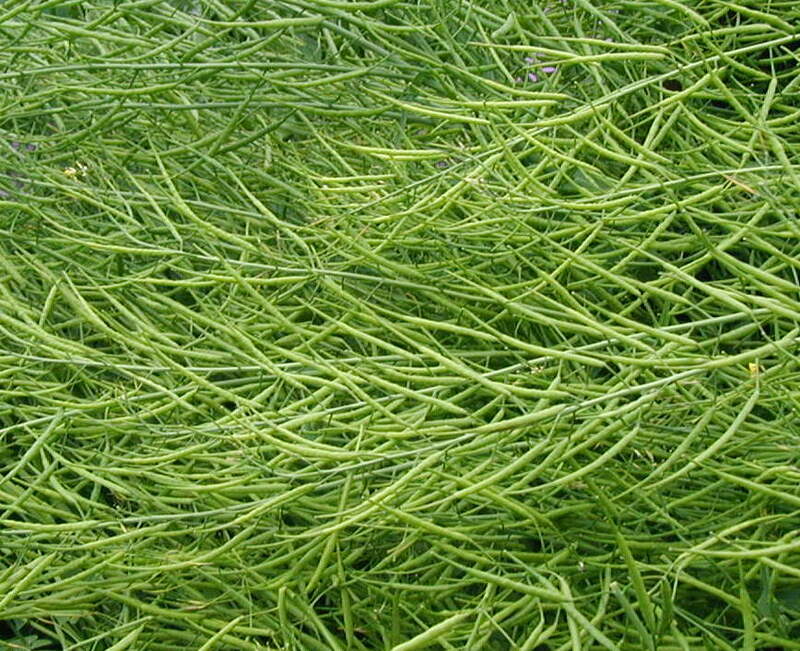 The field peppergrass is an alien plant, which are known for taking over areas. With a huge seed production it’s no wonder that this plant will seem like a perennial, coming back year after year. Field peppergrass along the roadside. 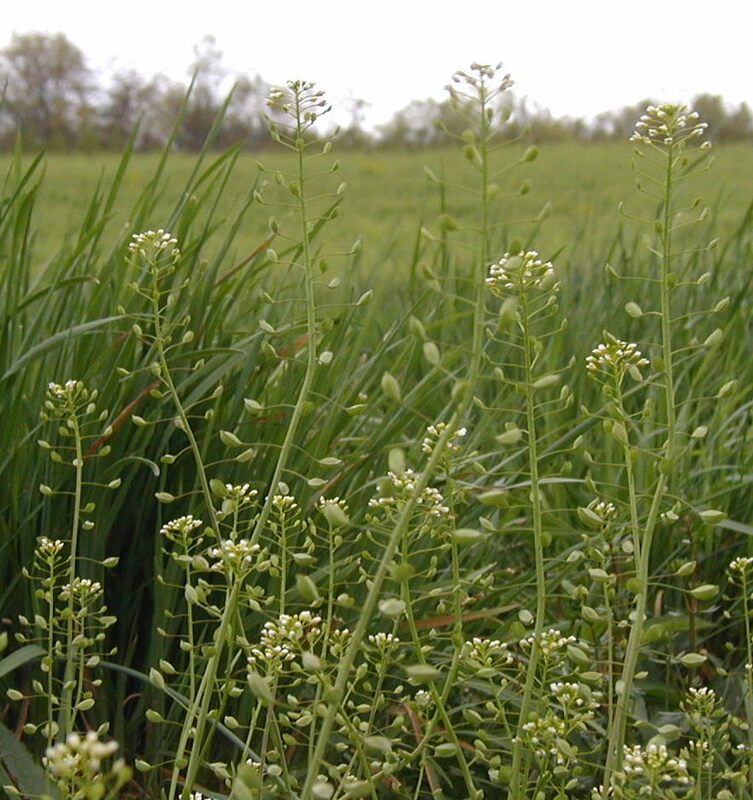 Field peppergrass is similar to Shepard’s purse, another member of the Mustard Family. 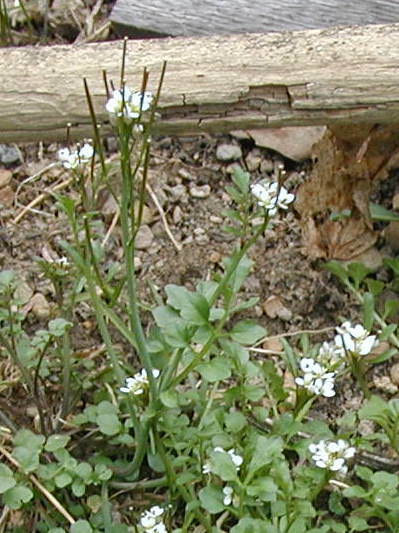 Mustards start blooming in early Spring, as witnessed by the white-blooming garlic mustard that we see practically everywhere. 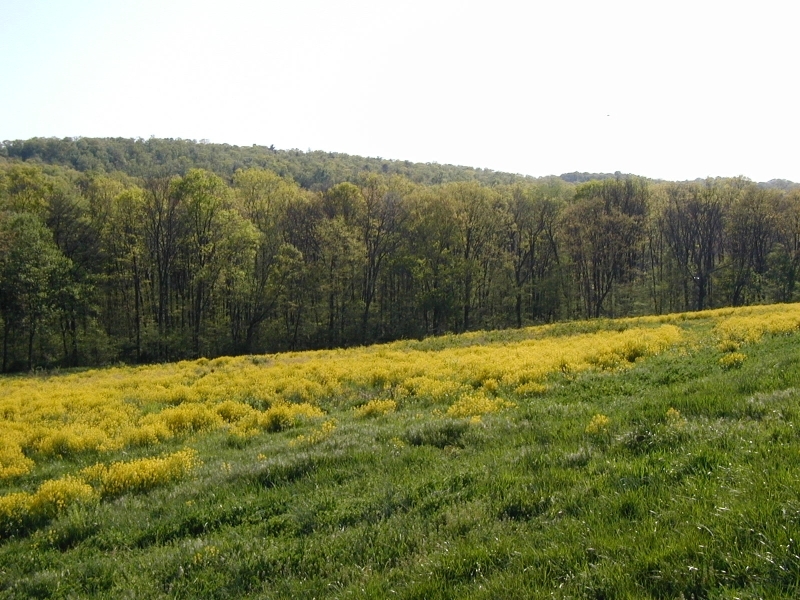 In other places fallow fields are showing yellow with blooming field mustards.